Oh, heaven help us, you are going to win this challenge, I know it! What a fun idea! I love magnet games because they make the fridge more exciting. Plus they can be made portable with just a cookie sheet. :) I also have a feeling you are going to win! Love this idea. WOuld make great stocking stuffers. I will want to make these. I think the ladies in the office would like these for their file cabinets. Fun! I love it! What a great idea! If your girls are like mine they will fight over the flower knobs! I was wonder what it was the black surface...very cool! clever idea! I wish I had half your imagination! This is sooooo cute! Unfortunately, won't work on my stainless fridge. Would be cute on a cookie sheet I guess. Great work! CUTENESS! This is such a fun idea. I love how it goes on the fridge. Thanks for sharing! This is awesome! I wish my stupid fridge wasn't stainless steal!! I miss magnets! I love what you said right up there explaining how, um, hard it is to reply to a noreply blogger!! Anyway, I love your blog! Especially the theme of a craft a month by Christmas! wow - you are so smart! I love this idea! So many options too - you could make different sets for different holidays. Love it!!! WAY to go! I love this idea! Way creative! 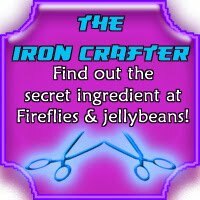 Thanks for linking up to the Iron Crafter!! That is really cute and clever! You know what else you could do with it? Bring it along on a road trip and let the kids play tic-tac-toe on a cookie sheet! How clever is that?! What a terrific idea! I love that its on the fridge - that would get tons of use in our house! This would get tons of play in my home. Love the creativity. Wow -- what a great idea! I have some leftover plain wooden handles that would work also by sticking the magnets on! Thanks for the step-by-step photos as well! Very cute! My kids would love this. Very cute and creative idea! Love this! Looking forward to staying tuned for other great xmas craft ideas. It is right around the corner?!?!!! im featuring your marvelous idea next week at MMM. thank you for linking up !! Well that is really cool. :) I like it! Sooo cute! I love it!! This is an awesome stocking stuffer, and I love that it's portable! Very cute idea! Thanks for sharing it! As soon as my kiddo is old enough...I'm definitely going to make one for some quick fridge entertainment. FABULOUS idea!! I love the idea of using knobs!!! Too cute! Thanks for sharing! This is such a cute idea!! The tope of the knobs are so cute! Thanks for sharing. Great idea! And what a great way to use of scraps of paper! I hate throwing them away; too pretty! I LOVE this! I started crafting for Christmas a few years ago and I'm always looking for great stocking stuffers. YOU came up with a great idea. Kudos. What a FABULOUS idea! I love this cute project! Thanks for linking up to Hoo's got talent! Those are cool and it reminded me of a friend's house that we visited a month ago. They also designed the door knobs like what you did and I just like it. One of the things that you can personalized. So how this tic tac toe knobs work? Will it open different doors or just one door? I want to know more about it since I'm in business venture right now and want to add this tutorial to my how to my "how to start a business" campaign.